After experiences that showed it was possible to make a low-budget skiff in lenin biocomposite instead of ordinary fibreglass, this year the Métis vela student team of the university of Padua through itself into the enterprise of building Athena, a fully recyclable 4.6 m skiff. The aim is to combine lynn in reinforcement with a special heat setting resin that makes the process fully reversible. 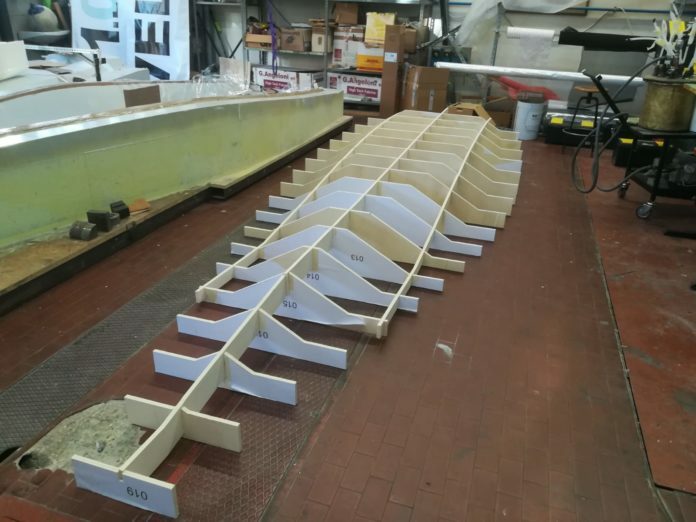 The Métis Vela team, the Padua University sailing team made up solely of students, has for more than 10 years been designing and building skiffs to compete against other Italian university teams in the annual 1001Vela Cup race. This race is run not just on the sporting level but obviously also on the technological level. The boats have to satisfy precise rules: 75% of the hull must be made with material from natural sources or, alternatively, be completely recyclable. It’s not a banal limitation: most of the racing dinghies in circulation are made with heat setting resins and glass or carbon fibre which, by its nature, guarantees excellent performance that does not have a good impact on the environment, above all because recycling it is problematical to expensive. The idea was born in 2016 when the French chemical company Arkema launched at the Paris JEC a fully recyclable Mini 6.50 made by vacuum infusion with carbon fibre and a special resin, Elium. This resin is one of the family of heat setting polymer is: this means that when subjected to high temperatures it can go from the solid-state to the initial liquid state and so can be recovered for further use. The resins most commonly used, on the other hand, do not liquefy but degrade and become unusable. Another revolutionary characteristic is the possibility of using this product with the vacuum infusion technique already widely used for traditional resins. In this way there is no need for a yard to invest in new equipment and the economic barrier of the initial investment falls down. From here came the prospect of importing this innovation to build a new green skiff that led to fruitful collaboration between the company and the University: Arkema, as well as providing the advice needed to exploit the resin to the fall, was prepared to supply the material needed for the experiment and the construction of a boat, while the students agreed to send technical feedback essential for the future development of the material. 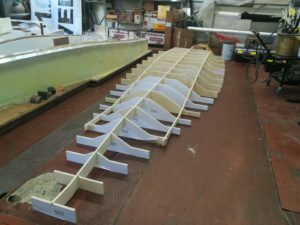 The recyclability of the new boat could not stop at the resin, but also the fibre and core of the sandwich making up the boat had to be equally sustainable. From here came the idea of using natural fibres and a core that was also heat setting. The choice of fibre fell on Lynn in, a material widely used by the team in the past and supplied by Ecotechnilin. The core used was a PET foam, already used in the boating sector and supplied by Diab. To reduce the absorption of resin the team decided to use panels without any treatment, heat shaping the panels on site to make them stick to the mould. In this way the cuts needed to bend the polymer foam were eliminated, reducing the normal accumulation of resin. But the solution demands many hours of work if done by hand as craftwork, but for industrial production it is in any case possible to heat shape the panels. The construction phase, which is still underway, is not without its difficulties. Elium recyclable resin demands special handling that makes certain passages difficult, especially for workers with little experience. First of all, it is necessary to study and infusion network that permits rapid distribution of the resin. The resin remains workable for a relatively short time, about an hour and a half at environmental temperature. To solve the problem a larger number of input points for the resin was used and the network was made denser to cover more space in less time. Another factor imposed by the nature of the resin is maintaining stable vacuum conditions throughout the process to guarantee regular polymerisation. Finally, particular attention needs to be paid with the material used to make the mould because the exothermic reaction develops a lot of heat and so the moulds must be designed and made taking account of the exothermic peaks of the system. After construction of the skiff is finished, the team will study the recycling process: grinding and thermolysis seemed the most promising routes for now, but the idea is to attempt to obtain complete separation of the fibres from the heat setting matrix also with chemical processes. A Life Cycle Assessment study is also planned to analyse the environmental impact of the product through its entire useful life cycle. The route taken by Mètis Vela is bold but concrete: they want to demonstrate that environmental sustainability really is possible by combining approaches oriented towards favouring the exploitation of renewable resources and at the same time their recyclability, without having to forego top-level performance. It’s only a matter of time.